Former ICC Chief Executive Officer Haroon Lorgat, now in Sri Lanka to study and advise the Board on the present status of cricket in the country, feels that the country should immediately start reshaping its game to face the competitive challenges that are coming in world cricket in the near future. The Sunday Times met the South African cricket expert in his Colombo office on Friday to get his views about his role and how he looks at the challenges. The Sunday Times Sports asked him how a person like him could fit into a third world scenario like Sri Lanka and their ways of running the game of cricket, after handling a huge responsibility like running the International Cricket Council and hailing from a country like South Africa. 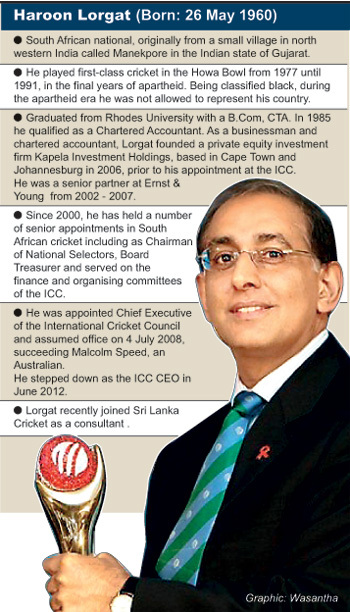 Lorgat said: “First of all you must accept that Sri Lanka is a top cricket playing nation and most of its cricket dealings are with first world administrations like the ICC, Australia, England and South Africa. So in such a reality the Lankans must perform along the same lines as the best do. It’s a mindset that’s required. “And let’s not forget that I also grew up in a third world like scenario where the apartheid system prevailed and in our youth we too were deprived of so many first world standards. So I am quite familiar with this sort of background”. Lorgat then explained that it is time that Sri Lanka made preparations to move to its next phase in cricket. He said that he was a firm believer in the ‘S’ curve theory. He explained that organizations often progress up the ‘S’ curve and unless it plans to catch the next ‘S’ curve it can fall down from a good position on the top of the ‘S”.� He believed that Sri Lanka needed to exploit its current position on the top of the curve by planning and structuring for a new era. Next we inquired about if he would be comfortable in the Sri Lanka environment where there is a lot of political interference in the game. Lorgat answered, “I do not have any political affiliations and intend to concentrate only on the job of helping Sri Lanka cricket move upwards. Even then I cannot effect any changes as I can only give my observations and advice and it is then up to your administration to implement them”.However, the former ICC CEO stressed that Sri Lanka should look carefully at their cricketing future. He said the World Cup would start qualification from 2016 whereby only the top eight teams would qualify while the two bottom teams would have to join aspirant teams like Afghanistan, Ireland, Holland etc. in a qualification tournament. The two top teams in that contest would then join the top eight to take part in a ten team ICC Cricket World Cup in 2019. At the same time in the World Test Championships, which will be played in 2017, only the top four teams would qualify to take part. So Sri Lanka must prepare from now to be among the top four of the Test playing nations before the cut off period arrives.